Your college education is an extremely important and expensive investment. Before you shell out thousands of dollars for an advanced education, you need to give yourself a basic education in the financial aid process. Navigating the college financial aid process can be hard enough even for the most highly educated people. So to help, I’ve put together a quick reference guide on the 12 most common financial aid terms used. Calculated based on a specific formula, which considers taxed and untaxed income, assets, and benefits, as well as the size of your family and the number of family members attending college during the year. 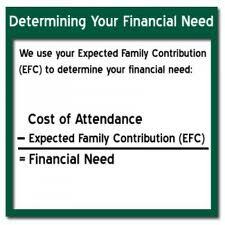 Your EFC is the number colleges will use to calculate your need for financial aid. If you know your estimated EFC ahead of time, you can ensure that all of the schools that end up on your final college lists are good fits financially as well as academically. Use this very useful table that provides a quick reference for your EFC based on income. According to this table, a family with an adjusted income of $50,000 and two depe ndents would expect to have an EFC of around $3,800 without considering any other financial assets.? A family with income of $100,000, would have an EFC of approximately $20,000. Use the tool provided by College Board to estimate your EFC. The largest form of student aid in the country — federal aid programs come in the form of government grants, loans, and work-study assistance and are available to students at eligible post-secondary institutions (colleges, vocational schools, and graduate schools). This is the student’s total cost of attendance that isn’t covered by the expected family contribution (EFC) or outside grants and scholarships. A student must demonstrate financial need to be eligible for need-based financial aid. If scholarships and grants don’t cover the entire cost of your tuition, you may need a student loan to fill the gap. Federal student loans don’t have to be paid while a student is in college, and there are a variety of loan forgiveness programs available. The rates and terms are usually more flexible than private loans. Loans get a bad rap in the media, but are good options when used responsibly for student’s education. Grant can come from the state or federal government, from the college itself, or from private sources and do not have to be paid back. There is little difference between a scholarship and a grant, though the general consensus is that scholarships are mainly awarded for academic merit (good grades) or for something you have accomplished (volunteer work or a specific project); also, there are need-based scholarships, as well. Like grants, scholarships don’t have to be repaid. The Federal Work Study program offers funds to eligible students for part-time employment to help finance the costs of college. This is usually a great deal for students. If possible, always check the question box that the student is open to accepting work study awards. College tuition is the “sticker price” of your education, and does not include room, board, textbooks, or other fees. Often colleges simplify the cost by providing a flat fee for tuition. Tuition varies by colleges, for in-state versus out-of-state residents, and for undergraduates versus graduate students. Be sure to also be comparing apples to apples between colleges; some colleges advertise their tuition rate for 12 college hours, others list it for 15 college hours. Cost of attendance (COA) is the sum of tuition, fees plus room and board, books, travel and personal expenses. If you don’t know the cost of a specific college, you can use the 2011-2012 national average costs for a 4 year public college ($24,000), a 4 year private college ($50,000) or 4 year elite college (the most selective and most expensive colleges nationwide, at $62,000 per year), to get a general idea of your child’s aid eligibility. the colleges to which you applied. Colleges aren’t required to follow a standard format for award letters yet, and important information is sometimes missing or misleading. Be sure to compare colleges’ complete Cost of Attendance minus “free money”. This will give the family the real cost to attend each school. Then, you can subtract loan amounts, 529 plans, and parental assistance to see which colleges are affordable for your family. I hope that these terms and tips were helpful in your journey towards a college education. If you have any questions, please feel free to contact me directly.